A graceful perennial grass of glens, shady banks and woodland. Easily recognised by the short, wide spikelets, each of a single flower only, borne on the slender branches of a long drooping panicle. 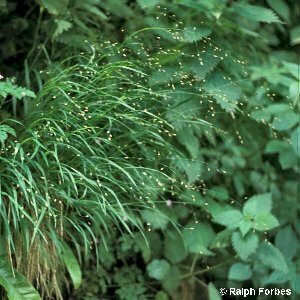 Melica nutans, found on limestone in northern Great Britain, is absent from Ireland. All names: Melica uniflora Retz. ; Melica nutans auct.